Malawi has an estimated population of 15.8 million of which 80% live in rural areas and generally practice subsistence, rain-fed agriculture. 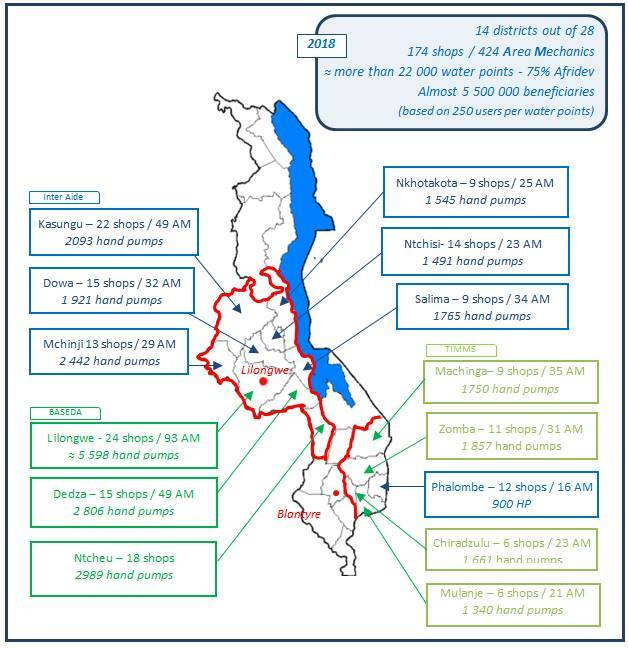 90% of improved rural water supplies in Malawi are boreholes or shallow wells equipped with hand pumps, vast majority are Afridev pumps, and some Malda in certain districts…). There are few piped gravity fed schemes (GFS). To improve this functioning ratio, some Operation and Maintenance (O&M) have been undertaken in Malawi since 1999. Maintenance can be differentiated between rehabilitation, repairs, or preventive maintenance (servicing) – see dedicated note on Pratiques website. Inter Aide and its local partners – the local NGO BASEDA (operating in Lilongwe, Dedza and Ntcheu districts) and its branch for the South region TIMMS (Zomba, Chiradzulu, Mulanje, Machinga) – implemented, trained and are following in coordination with local institutions – District Water Office (DWO) and District Councils – networks of hand pump technicians (Area Mechanics) and networks of hand pumps spare parts retailers. In 2018, it’s 424 AM and 174 shops that are providing maintenance services. The map above shows where these projects are now present (Click on it to enlarge it). They are covering an area that represents more than 22 000 boreholes or shallow wells and potential 5 500 000 potential users of these services. Shops owners are in direct link with suppliers. Indeed, with the upscale and increase of districts targeted, the demand became interesting enough for suppliers to sale spare parts in details and not only a full set of pump. Smaller shops of the network are passing through an intermediary shop in link with supplier. This video is illustrating the challenges related to access to water and water points maintenance. 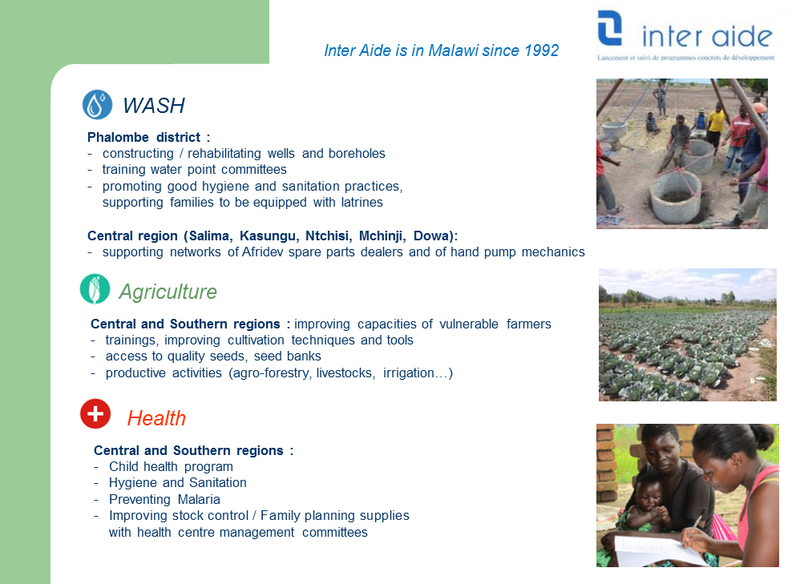 Inter Aide is also operating in Phalombe district for rehabilitation, construction of new water points, training water point committees on O&M activities, as well as for promoting good hygiene practices and use of improved latrines – see details on section other WASH activities. The documents, information, texts, images of this site are produced by InterAide's team. Some notes are also distributed through the "Pratiques" network (piloted by InterAide). Other sources are mentioned when content has not been produced by Inter Aide.